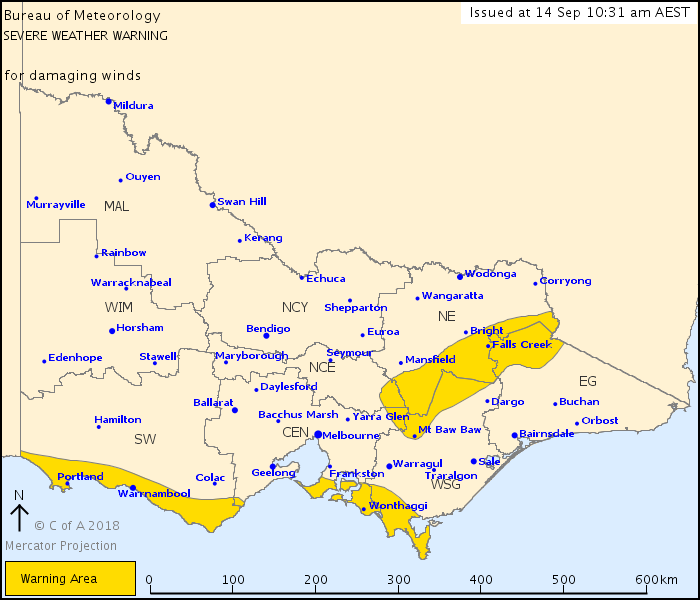 For people in parts of Central, East Gippsland, South West, North Central, North East and West and South Gippsland Forecast Districts. Issued at 10:31 am Friday, 14 September 2018. North to northwesterly winds will strengthen to 40 to 60 km/hr about elevated parts of eastern Victoria early Saturday morning, with gusts of 90 to 100 km/hr. Squally westerly winds averaging 40 to 60 km/hr with peak gusts of 90 to 100 km/hr will develop about the southwest coast during Saturday morning, then extend to parts of the central coast and south Gippsland by Saturday afternoon. Locations which may be affected include Warrnambool, Portland, Wonthaggi, Falls Creek, Mt Hotham and Mt Buller.